From recent news reports, it has come to our attention that smoking is a vice that “leaders” around the world are determined to stamp out. But why? The official story is that our ever benevolent governments wish to prevent “we the people” from damaging our health, and that of others (if you believe the “second hand smoke” fable. Those of a more cynical disposition claim that the truth has more to do government aims of cutting back on public health expenditure for preventable diseases like lung cancer. Yet this explanation is relevant only for those fewcountries where public health care is free and is also contingent on the, as yet, missing evidence that smoking really is the number one cause of cancer, rather than the many other pollutants that we all inhale every day. Given what we know of the contempt in which The Powers That Be hold most of humanity, and the lack of convincing evidence that even moderate smoking really is a risk to public health, we are forced to look for another reason for the increasingly world-wide witch hunt on smoking and smokers. Geneva – A global treaty aimed at dissuading children from smoking and helping adults kick the habit came into force on Sunday with the United Nations saying it could save millions of lives. The World Health Organization (WHO) applauded the strong warnings on cigarette packages and the eventual ban on tobacco advertising and sponsorship laid down in the world’s first international public health treaty. “It’s entry into force is a demonstration of governments’ commitment to reduce death and illness from tobacco use,” said WHO Director-General Lee Jong-wook in a statement to mark the event. Tobacco, the second leading cause of preventable deaths globally after hypertension, kills 4.9 million people a year, the U.N. agency says. And the annual death toll from tobacco-related diseases — lung cancer, heart attacks and cardiovascular diseases — could soar to 10 million by 2020, with 70 percent of the deaths in developing countries, it adds. The treaty, known as the Framework Convention on Tobacco Control, gives members three years to slap strong health warnings on tobacco packages and five years to ban advertising, promotion and sponsorship. It also recommends tax increases on tobacco products, a crackdown on smuggling, and reducing exposure to second-hand smoke. Approved by the WHO’s 192 member states in May 2003, the pact became law on Sunday, 90 days after the 40th state had ratified it. It will only carry legal weight in those countries which have ratified it, now numbering 57. In total, 167 countries have signed the pact — but have not necessarily sent it to parliament for ratification. WHO officials and activists say the powerful tobacco industry is lobbying intensively to restrict the number of countries applying the treaty, including the United States which has signed up but not yet sent it to the Senate. “The tobacco industry wants to be free to sell and market their deadly products in such a way that they have more and more profits. This is the only language the tobacco industry knows,” Vera Luiza da Costa e Silva, director of the WHO’s Tobacco Free Initiative, told journalists. Activists accuse the Bush administration, which signed the pact last May, of having worked hard to dilute it. “U.S. ratification of the treaty would send a strong message to the rest of the world that we will not support these efforts and instead put protection of public health ahead of tobacco industry interests,” the U.S. -based Tobacco Free Kids lobby group said. Some of the largest tobacco growers — India, Japan, Pakistan, Thailand and Turkey — as well as cigarette producing countries such as Britain, Germany, the Netherlands and Turkey are among those which ratified have the treaty, he said. The Bush administration may be working hard to dilute the anti-smoking pact, but the US remains one of the least smoker-friendly countries. Americans who visit certain European countries would be shocked at the freedom smokers have to puff where they please. The Himalayan kingdom of Bhutan has issued a ban on smoking in all public places. Coming just two months after a ban on the sale of tobacco products, the new law means that Bhutan now has the toughest anti-smoking laws in the world. The irony is that, even as smoking bans are becoming fashionable in the liberal West, it is an absolute monarchy with a reputation for human rights abuses that is leading the way. Once again, governments fail to understand that the very things they make illegal become the thing of greatest value. Didn’t we learn anything from Prohibition? (AP) In a smoke-choked Manhattan tavern, Cynthia Candiotti asked a neighbor for a light and took a deep drag on her cigarette, savoring a last barstool puff before the city outlawed smoking in bars and nightclubs. Ireland is set to ban smoking in the country’s pubs as of midnight Sunday. The move to ban smoking in Irish pubs is being viewed as a test case for the rest of Europe. The parliament in Montenegro, which has one of the highest rates of smoking in Europe, has passed a law banning smoking in public places. Plans to ban smoking in all closed public areas, including bars and offices, in Portugal could be in place by October, after parliament agreed to consider new proposals aimed at protecting passive smokers. Eedinburgh’s Lord Provost today threw her weight behind demands for a nationwide ban on smoking in all public places. Lesley Hinds, head of Scotland’s national health promotions agency and the Capital’s civic leader, called on the Scottish Executive to take the “brave” decision to introduce legislation as soon as possible. Omaha (AP) – Having Nebraska’s largest cities discuss bans on smoking in restaurants, bars and other workplaces could pave the way to a statewide ban, some activists say. “All states ultimately will go smoke free,” said Dave Holmquist, director of government relations for the American Cancer Society in Nebraska. Washington – A Virginia mother has been sentenced to 10 days in jail for defying a court order not to smoke in front of her children. ‘It should never have come to this,’ Ms Silvius said in a telephone interview after spending four hours in jail before being released. The sentence is the latest development in a long-running custody battle between Ms Silvius and her ex-husband Steven over their children, aged 10 and eight, but the restriction on smoking, especially in this tobacco-friendly state, has captured far greater attention. Her ex-husband’s lawyer, Mr Mark Murphy, said the measure was necessary to protect the health of the children, who live with their father and often visit their mother on weekends. The Silviuses have joint custody. Of course, the question in all of this is “why now”? Interestingly, around the same time a ban on smoking was being discussed in many countries, other information was coming to light that tells a very different story about nicotine and the most effective and accessible way of infusing it into the brain: smoking. Scientists have known for some time that smoking seemed to delay the onset of Alzheimer’s but they haven’t known how. A new study reveals the active agent is a by-product of nicotine itself, nornicotine. Published today in the journal Proceedings of the National Academy of Sciences, the study’s authors, Kim Janda and Tobin Dickerson of the Scripps Research Institute, say the known toxicity of smoking means using cigarettes as a fix isn’t on and that further research is necessary to produce a non-toxic mime of the nicotine/nornicotine effect. Heritable factors produce about one-third of Alzheimer’s cases. About 20 per cent of the population, for example, carries a gene known as Apoe 4, which puts them at greater risk of developing the affliction and doing so earlier in life. But the balance of Alzheimer’s seems to be down to environmental factors and risk is accelerated by side-effects of the aging process. High among those biological inevitabilities is a stiffening of the blood vessels in the brain, a process accelerated by high blood pressure. Stiffening in these vessels reduces the amount of oxygen that passes to brain cells, making them less efficient and eventually causing them to die. Nicotine, the scourge of 20th-century medicine, might actually benefit people suffering from debilitating brain disorders such as Parkinson’s and Alzheimer’s diseases, according to new scientific studies of the drug. Could tobacco save your life? Light a cigarette and inhale lungfuls of smoke. Good for you? Hardly. But spend time with people suffering from schizophrenia or other forms of severe mental illness, and you’ll find many of them going at it like chimneys. Why? Poor judgement about the consequences, perhaps. Or the need for anything to soothe their distress. But there’s a third possibility that is much more intriguing. For them, and others with psychiatric and even physical illnesses, smoking amounts to an oddly neglected form of self-medication. Of course, tobacco smoke – an airborne cocktail of nasty chemicals – is harmful. What’s at issue is a single non-carcinogenic ingredient: nicotine. This already has one medically approved application: taken by mouth in the form of gum, or through the skin from an impregnated patch, would-be ex-smokers aim to absorb a dose sufficient to dampen their cravings. And for many trying to kick the habit, particularly when used as part of a complete programme, it works. But though we hear occasional whisperings of other possible benefits of nicotine, they never seem to get taken seriously. Attempts to use nicotine in Parkinson’s date back to the 1920s when one clinician injected it intravenously into a dozen patients. Although benefits were immediately apparent, little more happened for 50 years. Interest picked up again in the Eighties, but virtually all studies used small numbers of patients, and results were mixed. Even so, to quote Balfour and Fagerstrom, “the experience from these few cases, although mostly uncontrolled and preliminary… warrants further investigation”. For one thing, they say, nicotine may improve only certain symptoms, so may be more valuable to some patients than others. Nicotine has also been tested in small studies on pain, depression, attention deficit hyperactivity disorder, obesity and anxiety. In these disorders the evidence so far has been even more patchy. But serious research programmes have often been triggered by less impressive findings. So why the relative lack of interest in nicotine as a research topic with clinical payoffs? So what is it about smoking, and nicotine in particular, that prevents or lessens the effects of Alzheimer’s and Parkinson’s Diseases among others? The answer, it seems it to be found in nicotine’s capacity to mimic the effects of a molecule found naturally in the body. Either aliens are visiting Manitoban airspace more frequently, or the smoking ban has forced people to spend more time staring at the sky. Whatever the reason, a report released yesterday by Ufology Research of Manitoba states that there were 112 UFO sightings in Manitoba last year, which more than doubles the previous record for sightings and is more than four times as many as in 2003. In fact, the 882 sightings across the country last year also constituted a record, but UFO researchers are baffled as to why. “It is puzzling. We know things are up all over Canada. In fact several provinces saw all-time records last year,” said Chris Rutkowski, the research co-ordinator for Ufology Research of Manitoba, a group of about a dozen people who compile UFO sighting statistics for all of Canada. Certainly the author of the above article did NOT intentionally associate the anti-smoking laws with aliens, but it just may be that there IS an association! Consider first of all the fact that the “anti-smoking” campaign began in the United States, the same United States that thinks it is okay to lie about Weapons of Mass destruction in order to justify killing hundreds of thousands of innocent Iraqis, the same United States that will not support the Kyoto Protocol to halt Global Warming that may kill billions of people. 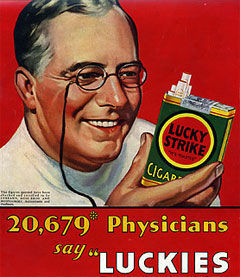 Has anyone ever wondered if the illnesses that are blamed on smoking might very well be caused by the pollution and toxins in our air, water, and food, and are blamed on smoking so as to maintain the commercial viability of the real causes, while at the same time, creating a nation of law-breakers so that the government can cash in on the guilt as Ayn Rand suggested? Now, nicotine is a most interesting drug. Nicotine mimics one of the body’s most significant neurotransmitter, acetylcholine. This is the neurotransmitter most often associated with cognition in the cerebral cortex. Acetylcholine is the primary carrier of thought and memory in the brain. It is essential to have appropriate levels of acetylcholine to have new memories or recall old memories. Acetyl-L-Carnitine (ALC) is the acetyl ester of carnitine, the carrier of fatty acids across Mitochondrial membranes. Like carnitine, ALC is naturally produced in the body and found in small amounts in some foods. …Research in recent years has hoisted ALC from its somewhat mundane role in energy production to nutritional cognitive enhancer and neuroprotective agent extraordinaire. Indeed, taken in its entirety, ALC has become one of the premiere “anti-aging” compounds under scientific investigation, especially in relation to brain and nervous system deterioration. It turns out that Alzheimer’s, a veritable epidemic in our country, is directly related to low levels of acetylcholine. In Alzheimer’s disease, the neurons that make acetylcholine degenerate, resulting in memory deficits. In some Alzheimer’s patients it can be a 90 per cent reduction! But, does anyone suggest smoking and exercising the brain as a possible cure? Work in the Laboratory of Neurochemistry at the Barrow Neurological Institute principally concerns molecules critically involved in such signaling called nicotinic acetylcholine receptors (nAChR). nAChR act throughout the brain and body as “molecular switches” to connect nerve cell circuits involved in essential functions ranging from vision and memory to the control of heart rate and muscle movement. nAChR also happen to be the principal targets of tobacco nicotine. …nicotine-like medicines show promise in the treatment of diseases such as attention deficit/hyperactivity disorder (ADHD) and Tourette’s syndrome and in alleviation of anxiety, pain, and depression, suggesting involvement of nAChR in those disorders. …We have shown that numbers and function of diverse nAChR subtypes can be influenced by many biologically active substances, ranging from steroids to local anesthetics, and by agents acting on the extracellular matrix, the cytoskeleton, on second messenger signaling, and at the nucleus. We also have shown that chronic nicotine exposure induces numerical upregulation of many diverse nAChR subtypes via a post-transcriptional process that is dominated by effects on intracellular pools of receptors or their precursors. Now, notice in the above account how tricky they were when they said that nicotine …” That is jargon for “it increases the number of receptors” as well as the amount of acetylcholine. But, of course, the AMA wouldn’t let them get away with any of their work if they weren’t adding that they have a hypothesis that “habitual use of tobacco products… disables acetylcholine.” Never mind that in the beginning they are proposing it as a therapeutic drug for some of the very problems that have risen to almost epidemic numbers in the present time. Let’s say it again: Research shows, however, that daily infusions of nicotine actually INCREASE the number of acetylcholine receptors by up to 40 %. Some researchers, such as the above, brush this finding off by saying “regardless, their function diminishes.” But that is not empirically observed. Most people who smoke find a “set point,” and once they have reached it, it does not take more and more and more to satisfy it. Acetylcholine acts on nicotine acetylcholine receptors to open a channel in the cell’s membrane. Opening such a channel allows certain types of ions (charged atoms) to flow into or out of the cell. …When ions flow, there is an electrical current, and the same is true in the nervous system. The flowing of ions, or the passing of current, can cause other things to happen, usually those “things” involve the opening of other types of channels and the passing of information from one neuron to another. …When a substance comes into the body that can interfere with ACh binding to muscle nAChRs, that chemical can cause death in a relatively short time (because you use muscles to do things like breathe). A class of chemicals in snake and other poisonous venoms, neurotoxins, do exactly that. If you are bitten by a krait or a cobra, for example, and enough venom gets into the blood, there will be enough of their neurotoxin in your body to shut down the diaphragm muscle expands your lungs. Without that muscle functioning, the person ceases to breathe and dies of asphyxiation. Alcohol is a great pretender and can fool at least four types of receptors. It blocks the acetylcholine receptors… However, unlike nicotine which also binds to the acetylcholine receptors, alcohol doesn’t do anything useful while there. It simply sits there and blocks the ability to think. It also acts like cocaine in that it blocks the dopamine reuptake, flooding the brain with “feeling good.” Alcohol stimulates the release of endorphins, thus resembling morphine and heroin to a greatly lessened extent, and it modifies and increases the efficiency of the seretonin receptors. It seems that the key to this is the fact that learning, hard thinking and pondering, requires that certain brain chemicals – usually acetylcholine – be squirted out at just the right place and in the right quantities. It is becoming clear that the molecules of memory are blind to the kind of memory – whether it is conscious or unconscious – that is occurring. What determines the quality of different kinds of memories is not the molecules that do the storing but the systems in which those molecules act. If they act in the hippocampus, the memories that get recorded are factual and accessible to our consciousness. If the chemicals are acting in the amygdala, they are emotional and mostly inaccessible to conscious awareness. It seems that this “working memory,” or “awareness,” is – if not consciousness itself – at least a window to it.